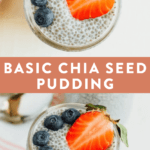 The best basic chia seed pudding recipe and info about the proper ratio of chia seeds to liquid. 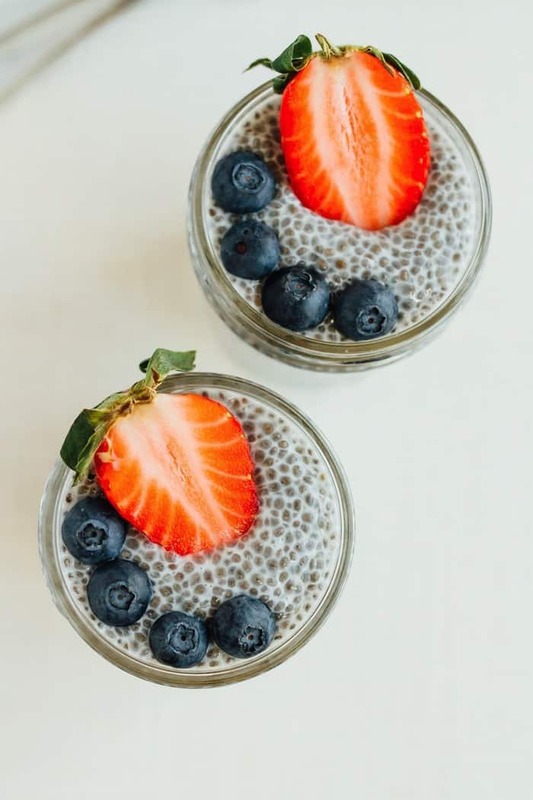 Start with this basic chia pudding recipe and then experiment with your own variations to enjoy for breakfast, as a snack or dessert. Vegan, gluten-free, paleo and keto-friendly. Let’s talk chia pudding! It starts with chia seeds, tiny little seeds that are packed with nutrition. Check out my post about the health benefits of chia seeds to see just how amazing they are. Chia seeds are a staple for those of us in the health and wellness space, but I know there are a ton of people out there who haven’t tried them yet. The one benefit of getting into chia seeds now is that they’re super accessible and almost all grocery stores carry them. A few years ago they were a bit harder to find and usually only sold at natural food stores or online. There are a TON of chia seed recipes out there (and I have dozens posted here on EBF), but if you’re chia newbie, chia pudding is an awesome first-timer recipe because you’ll get a real sense of their absorption power, the gel-like texture they create and their ability to help keep you full. The liquid is up to you and will vary based on preference and dietary restrictions. I love using plant-based milks like almond, cashew and coconut milk. They give the chia pudding a creamy consistency that’s really nice. Full-fat canned coconut milk is great if you’re looking to increase the thickness and make a really filling breakfast, snack or dessert out of the chia pudding. It’s also a great option for people who follow the paleo or keto diet. What Does Chia Pudding Taste Like? As for the texture, it’s like a thick, creamy tapioca pudding. And chia seeds have no flavor so the pudding will taste like whatever liquid and mix-ins you’re using. If you want the pudding to have a bit of sweetness you can add sweet spices like cinnamon and cardamom, vanilla extract and your sweetener of choice. 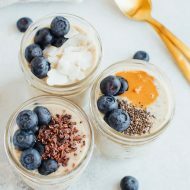 I’m a big fan of maple syrup so this basic chia pudding recipe has vanilla and maple syrup added. Honey is a great option if you’re paleo and if you need a sugar-free option, just skip the sweeteners all together. For a chocolate version, add some cacao powder to the mix. How Long Does it Take For Chia Pudding to Get Thick? The chia seeds start to absorb the liquid pretty quickly, but you do need to give the pudding a bit of time to build the gel-like consistency. I usually add the liquid, give it a good stir, let it sit for 5-10 minutes, give it another stir to make sure the chia seeds aren’t clumping and then let it sit in the fridge for an hour or two, but if you’re in a rush you can eat it within 20 minutes or so, it just might be a little liquidy. Another great option is to make it the night before you want to eat it and let it sit in the fridge overnight. 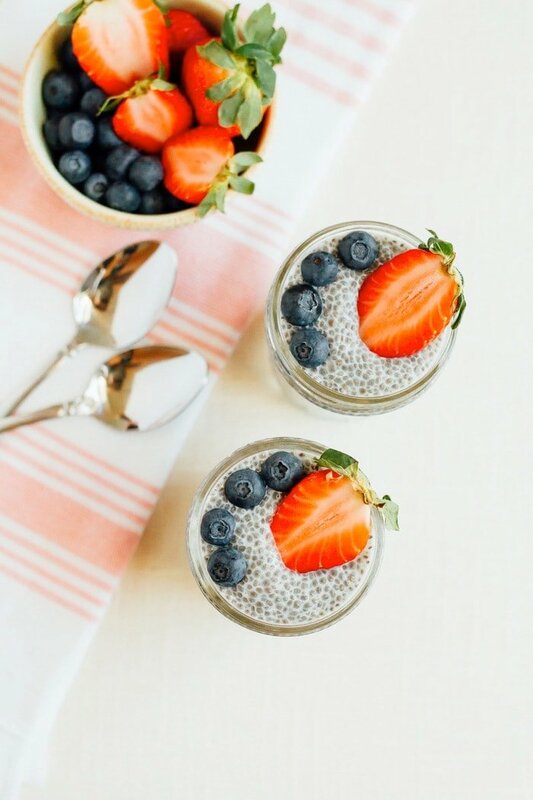 Chia pudding is an awesome meal-prep option. Make a batch on Sunday to have in the fridge for a quick breakfast, healthy snack or dessert. It’s loaded with fiber, protein and healthy fats, low in sugar and super filling! Plus it works with so many different dietary preferences. 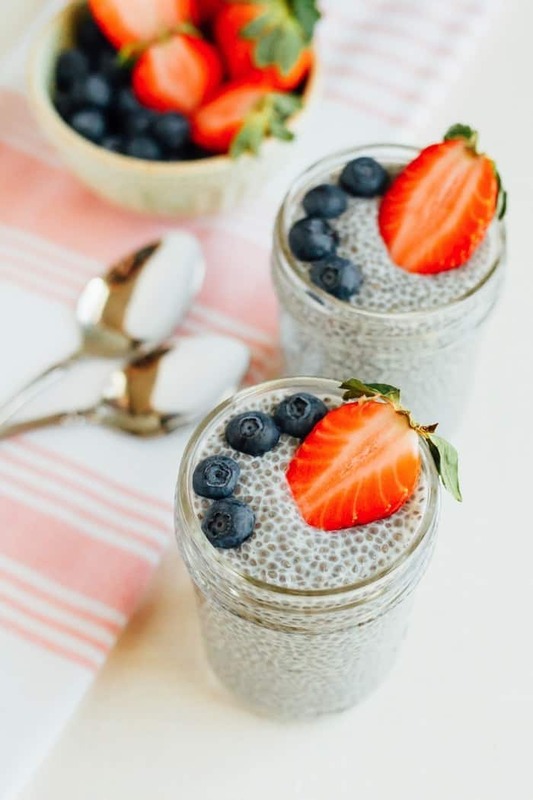 Depending on the mix-ins chia pudding can be made vegan, gluten-free, paleo and keto. 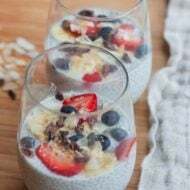 If you try this recipe for chia pudding please be sure to leave a comment and star rating below letting me know how it turned out. Your feedback is super helpful for the EBF team and other readers. Once the chia pudding mixture is well combined, let it sit for 5 minutes, give it another stir/shake to break up any clumps of chia seeds, cover and put the mixture in the fridge to “set-up” for 1-2 hours or overnight. The chia pudding should be nice and thick, not liquidy. If it’s not thick, just add more chia seeds, stir and refrigerate for another 30 minutes or so. Nutrition facts calculated with unsweetened almond milk and 1/4 cup blueberries, but without any sweetener. all of your chia recipes look wonderful. I wish I had some right now! I don’t know what I’m doing wrong, I leave it overnight using either almond or cashew milk but it doesn’t all harden. There’s a top layer of liquid that doesn’t jell up…..
You might have to play around the with ratio since some chia seeds are different than others in terms of how much liquid they’ll soak up. I usually soak the Chia seeds in boiled water for 10 mins then add them in. This makes my pudding turn liquified. Even after setting overnight. I want to add more chia seeds but don’t know how many spoon. Maybe I can experiment with 1tsp and see. Thanks Britney for suggesting something I can make again. I am serving this dessert at a upcoming Christmas party ? 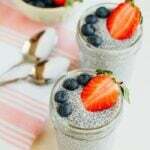 Yum, it’s been awhile since I’ve made chia seed pudding and this looks wonderful, thanks! This sounds amazing! I need to whip it up soon! Love me some chia seed pudding! All the different variations you can do with the mix-ins makes me one happy girl! Looks delicious. Chia is a way to go for great fats and fiber. Informative post about chia seed.It will be very helpful for those who new to this seed. I thought this was low cal. Am I missing something? 739 cal per 1 cup serving? ditto. I read the same thing and gasped. I have to be missing something. Someone enlighten us, please!! Nothing about low-cal is mentioned. However, it is keto friendly (low-carb, high fat), paleo friendly, vegan, and gluten-free! Very different things! I love this basic recipe, thank you so much for sharing it! If I use s fruit juice will it come out like a jello? Hi Elizabeth. It will kind of be like jello, but still more pudding-ish. I feel like jello is more cohesive than chia pudding, if that makes sense. 🙂 Let me know if you try it. Could you use cow’s milk for this as well?? Yes! Cow’s milk works great too. But please rather don’t <3. Look up "Dairy is Scary" on YouTube. Plant-based milks are healthier and cruelty-free! Oh seriously! Let her have cows milk if that’s what she wants. I’m all for almond milk and make my own but all these attempts at converting people to the vegan lifestyle through the passive aggressive messages are ridiculous and exactly why nobody wants to listen anymore. Asking someone to look at an educational piece is not passive aggressive. It was a polite message. Giving up dairy does not absolutely mean someone is vegan. What is passive aggressive about her comment? Why so defensive when someone offers free nutritional advice? You can politely decline it, or you can look it up, but you don’t need to get offended. If we find nutritional information that has added value to our health and lives, wouldn’t it be nasty to withhold it from others? Why are people so offended by *everything* these days. Her comment was kind and thoughtful, not pushy or passive aggressive. Chill out! So true!! I think Kati has a conscience issue going on…..
No need at all to use dairy for what is a fantastic, nutritious and cruelty free/ planet friendly recipe! Dairy can be cruel, when they are raised CAFO style, but cows can live a great life on some organic and/or pasture raised farms. I’ve been to hundreds of them in my work and they vary a lot. Dairy is healthier from these farms (see research on õ3FA), workers are better treated and cows are better. I see both sides of the argument, but if you’re going to eat dairy, pay a bit more for quality and health. I agree 100%. I don’t think the intent of the poster was to convert anyone to a dairy-free, vegan life-style. She was merely stating some well known facts, namely that plant-based milks are a healthier alternative, both from the consumer’s standpoint and the poor cow who had to endure the whole process. If Kati doesn’t like the “passive aggressive” message then she doesn’t like it. Cruelty free?! Do you realize how “CRUEL” it is to NOT milk a cow?! Dang Angie, I didn’t know that cows lived in pens and were forced to remain continurally pregnant in nature. Thanks for the education. Wow, I made this 3 days ago – used a variation due to what I had available but its terrific. Chia pudding never worked for me before. I used 1 cup milk, 5 oz coconut milk from can, 3 oz greek yogurt. Sweetened with 1 Tbsp Maple syrup and pinch of stevia. NOT overly sweet. Can’t walk by the refrigerator without spooning it out. Thank you so much Brittany! By the way, the shaking method in a quart “Ball” jar is wonderful!! I’d love to make your chia pudding but I am based in the U.K. So please could you tell me what one cup is? I would like to try just making one serve with 3 tablespoons first. Hello, I bought ththe Badia Chia seeds from Walmart and they are black and white. Is this ok? Your pictures show white seeds. Is there a difference? Yup! Those will work just fine, Sania! Enjoy. Hi! If I use to meal prep, how long can I leave in fridge before it goes bad? It should keep for about 5 days in the fridge! I also meal prep, so knowing it will keep for several days is great! I haven’t tried it yet, but I’m going to make a single serving tonight to see if I like it. Made this last night and omg it was yummy. Thank you for the recipe. I think the recipe is 1c liquid to 3tblsp chia seeds. Could that be the problem? Thank you for the reply! Barb is correct, you should use 1 cup of liquid to 3 Tablespoons of chia seeds. I followed directions to the T. 2cups unsweetened almond milk 6 Tblsp chia 1/2 tsp vanilla and Birch syrup. Left overnight but not pudding still liquid. Me too ended up with liquidiser and a shake. Had the cacao nibs in it but did not like the bitterness. This is so good! 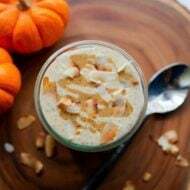 Made with 1 1/2 cup of unsweetened almond milk and 1/2 cup vanilla almond milk creamer. I had to add an extra tablespoon of chia to get the right consistency, other than that it turned out perfect! 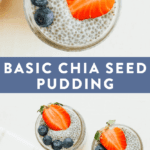 I am a newbie to chia seeds and I am so excited to have found your recipes. My first attempt is in the fridge now. Looking forward to trying your banana split recipe! Thank you for the clear directions! My pudding is still a liquid consistency. And 6 tbsp of Flax and Chia seed blend. Are the flax seeds causing a problem ? I think you need to just use chia seeds. Mine turned out great! The flax combination could very well be causing the problem because I don’t think the flax seeds absorb quite the same as the china seeds do. Just tried this recipe and it came out wonderfully! Thank you! My chia pudding is making clumps. I tried giving it a stir 10 minutes after i put it in the fridge, but it does not work. I just sits at the bottom in a big clump. I can’t get my pudding thick enough. Suggestions? I read through all the comments and wondered why so many people are having trouble with the consistency of the pudding. Then I made my own two batches today: the first batch I made with freshly blended cashew milk and it thickened immediately, the second batch I put the cashew milk in the fridge for a couple of hours before adding the chia and was surprozed to gind out it was very slow to expand. So, if you are using nut milks from the fridge, that might be the reason why it’s not thickening. My suggestion is to let it sit longer until the milk warms up and the Chia can expand before putting it in the refrigerator overnight. Hope this is helpful. 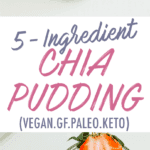 My pudding won’t thicken enough using exact measurements and extra chia. Should the milk be room temp? Should I let it sit out in room temp for a while before refrigerating? Wondering why I waited so long to try this. Made it 2 days ago, and am enjoying immensely! Used 2 c unsweetened coconut milk (from a container, not canned) and the 6 tbsp of chia, along with the remaining ingredients. Love it with a few crushed almonds, and little drizzle of syrup or honey. Also tried it with a few coconut flakes mixed in. Thank you, Brittany! Your proportions were spot on. Seems the possibilities are endless! Hello, could you substitute the almond milk with yogurt? I gotta say, I am so excited to try all of these. Thank you for compiling such a great list. Hi! This looks really good and I’m planning on whipping some up tonight, yet I was wondering how long this pudding stays fresh? Thanks! So obsessed with these puddings, I have them every morning for breaky and they’re SO YUMMY!! I’ve been wondering about trying this with heavy whipping cream. Do you think it would work? I haven’t tried it yet, but I definitely think it will work! I made this with 1 cup of liquid (coconut milk/chocolate milk and protein powder) with 3 tbsp of chia seeds and it came out runny 🙁 did I do something wrong? I haven’t tried this recipe yet, but it sure sounds amazing! I have just one concern; If you don’t want to use a sweetener, won’t the mixture just end up being cold milk no matter how long you wait? Hi Rachel! Nope, the mixture will gel up because the chia seeds. You don’t need any sweetener to make that happen. Made the basic recipe and loved it !!! Great recipe! It should last in the fridge at least 2-3 days! Delicious. Loved it. I’m seriously watching my calories at the moment so I made a batch with unsweetened almond ‘milk’ and a dash of vanilla. Having a quarter portion with fruit as treat. …. admittedly my son did ask why there’s frog spawn in the fridge! Going to try different flavourings and toppings. Quite fancy using almond essence. I find that the yogurt bothers my stomach.but I really love it. Praise the good green earth that gave us this bountiful seed to thicken our drinks into a tasty pudding. Amen! I made these last night, exactly per the recipe (with unsweetened almond milk). I left them overnight and they’re still runny. If I add more chia seeds will this help? This is my second time making this recipe. It turns out great. I used natural cane sugar for the sweetener.My family loves it? I just made my pudding with what I had. So I used unsweetened almond milk, coconut water vanilla extract, pumpkin pue spice and a tsp. of honey. Topped it off with raisins and cranberries. OMG. I will be making this alot now. The best desert ever. Yay! Love the pumpkin pie spice in there. So glad you liked it. These are the best chia recipe I have seen. I liked all of them. How is this Leto friendly at 18g carbs? U have to minus the fiber. ..17g. As with several of the other reviews, left overnight, mine is still runny. Precisely Followed the recipe. Help! Why? Hi, i make this as directed using 2 c rice milk, 6 tbsp chia seed, 1 tbsp honey or maple syrup, a dab of vanilla, stir 5 min. Shake it in a jar and refrigerate overnight. Always comes out perfect. I wonder if people are using six Tablespoons or six teaspoons when measuring the chia seeed? For two cups liquid ypu need six TABLESPOONS,or nearly 1/3 cup of seeds. I love this stuff, my body craves it! 6 tablespoons is exactly 1/3 of a cup. I may be jumping the gun, but I did lick the spoon and I can already tell this is going to be epic. I did change the recipe a bit – I used cashew milk and added 1 tsp. coconut extract in order to avoid the fat and I used 2 1/2 tablespoons full of agave instead of maple syrup because it’s sweet without the maple flavor. CAN’T WAIT until the pudding is ready! I followed the recipe exactly as it’s listed: 6 Tablespoons–not teaspoons–of chia seeds and 2 cups of unsweetened almond milk (along with the other ingredients), and it’s still runny after sitting overnight. Not sure why it seems to have worked for others but not for me. I’m trying to figure out why the recipe isn’t working for some people. Would love to know what brand and type of chia seeds you used? Maybe we can get to the bottom of this! My chia seed pudding was not thickening up fully either. I was eating it after 2 hours. I decided to try letting it sit overnight. I still did not get a thick pudding this morning I stirred it and put it back in the refrigerator for another hour. It was great. I really like it with unsweetened vanilla almond coconut milk. I added some coconut flakes and dried fruit too. Followed this recipe exactly (except using cow’s milk) and it came out very liquidy. I left the pudding overnight in the fridge. Any thoughts? Are there different types of chia seeds? Hi Noah. Did you give the chia seeds a stir after adding the liquid and after letting it sit for 5 minutes? There are different types of chia seeds (white and black) and it seems from the comments on this post that some chia seeds absorb more liquid than others. What brand and type did you use? I used almond milk, black chia seeds (Bob’s Red Mill I think), cocoa powder and stevia and it came out liquidy. I still ate it and it tasted good, but I was hoping for a thicker texture. Sometimes you have to play around with the chia to liquid ratio. Maybe try making the recipe again with less milk or more chia seeds. Thanks for the recipe. Here’s my variation. I think because of one factor that was just dumb luck it had no problem thickening up. I pureed in my blender 2 cups Coconut/Almond blend milk with 1 mango. Added a little bit of maple syrup and vanilla extract to taste. Added 6 tablespoons “Milled” Chia seeds. I noticed as I adding that it was milled, which looks to be ground or crushed? When I added it to the liquid it started to thicken almost immediately. Still stirred after 5 min. and popped into the refrigerator. I think it gave it more of a “dirty look” than if I had used the whole chia but that’s ok. Yummmy! So happy with my first try. Hi, my pudding doesn’t have the pudding consistency but it’s good. I used almond milk nd stevia liquid. I want to ask you how do you calculate the nutrients because I put the ingredients in Carb Manager app and the results are completely different. I made this recipe with the listed ingredients and added approximately a tablespoon of cacao. I used coconut milk and a splash of coconut water. It worked perfectly and was delicious. I do think that the people having problems with it being runny are possibly confusing tablespoons with dessert spoons. Great recipe and I will use it again and try a few of the other variations. Thanks for the recipe Brittany. Hi I made chia seeds in liquid kefir and chopped up fruit. I don’t think the seeds turned to jelly at all? left it in the fridge 2 days as well. I wish I can get the seeds to be similar to tapioca. Help? Hi Star! Are you 100% sure you used chia seeds? If so, what brand? Oh yum! I love the idea of a lemon chia pudding. Sounds so good! I followed the recipe but mine didn’t gel after 24 hours. I used almond milk and maple syrup. Do you have any ideas of how I can get it to gel? Hi Amy. My recommendation would be to add more chia seeds and let it sit for another 30 minutes or so. Maybe 1-3 Tablespoons more depending on how much liquid is left. Let me know if this helps! I have been tracking the responses and most of the ones which mention “runny” are with almond milk. Does anyone have success with almond milk? I use boxed coconut milk and it’s perfect although sometimes needs to sit longer. Will try stirring it the full 5 next time. I agree, I think coconut milk makes for a thicker chia pudding! I was really excited about this recipe since finding out my daughter was lactose intolerant, as it has so much of the nutrition she is missing by not being able to eat dairy. I made it as written, except I used Ripple Original milk (pea-milk) since I didn’t have almond or coconut milk on hand. I don’t know if it’s the consistency of the gelatinous chia after it absorbs liquid (and mine definitely absorbed as it was supposed to), or the taste of the Ripple instead of using almond or coconut milk, but this made me and my daughter gag. We both could not even swallow it, we had to spit it out it tasted so bad. I tried adding more maple syrup, some honey, and I even tried blending in my food processor to fix the consistency, but it was still awful. I don’t know if I will be brave enough to try again with coconut milk, seemed a huge waste to throw it all down the drain. I am scratching my head in disbelief that so many people have commented that they liked eating this. I am addicted to Ripple milk. I have tried to mix it in just about everything. And in just about everything it has been disgusting. It turns into something similar to wall paper paste. It’s best just to drink it as it comes. I think it is just at its point of maximum absorption, so adding anything pushes it to a solid state. I highly recommend trying the chia pudding with another milk alternative though. It is delicious with almond milk. I am not a fan of drinking almond milk though, but I really like it in chia pudding. This recipe looks great. How long would a batch last in the fridge before going off? This looks pretty simple as an alternative to a different recipe I had that suggested boiling. Thanks! Oh yeah! There’s no need to boil the chia pudding. That’s so interesting that you found a recipe that recommended that! Can I add blueberries to the initial mixture before putting in the fridge? I just want to take it from the fridge in the morning to work. Why is it so high in fat? Is there a way to change that? Yum! Used maple flavoring instead and a little stevia. Perfect ratio. First time using full fat coconut milk and turned out fantastic. Tucking this up my sleeve! Thanks! About how much fruit would you use if you add it to the mixture then fridge it all? I sweetened it with erytritol and served it with thinly sliced mango and buckthorns, very tasty! Mine thickened but the seeds were not jellied they were more crunchy. Any ideas why? If you wanted to make a fruity version, how much fruit would you incorporate into the blend? As opposed to cut up pieces added after its set?